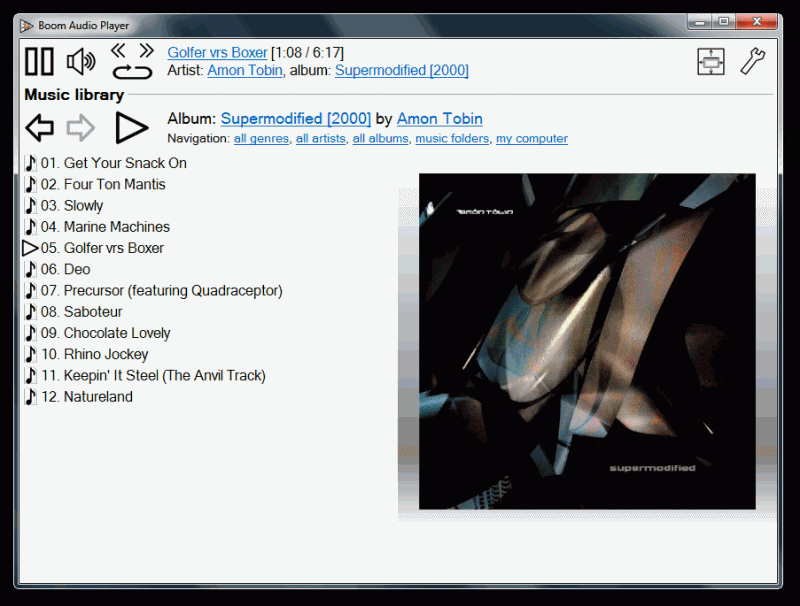 Boom is a lightweight and simple audio player featuring gapless playback, ReplayGain support, a convenient structured genre/artist/album/song view of the indexed files etc. The program supports most major formats including MP3, Ogg Vorbis, FLAC, Musepack (MPC), WavPack, WAV, AIFF, MP4/M4A (requires Microsoft codecs included with Windows 7) and WMA. Developed by the author of foobar2000, the program includes a simplified version of it's Properties dialog that provides basic tagging capabilities. Note: When running in portable mode, Boom will index the contents of the folder it's installed in. Fixed truncated text in certain high DPI modes. More robust handling of badly muxed MP4 files. I agree with User2100. This is a very fast launching player with a very small footprint, but the lack of a time slider is a big issue. I like this player, very small footprint, fast open, thanks for a nice music player. I didn't have to do anything it went right to my music folder and was ready to go and on my computer is only 2.04 Mb in size. Works 4ME thanks again. There are lighter lightweight players with more features, but this is a single executable player that doesn't seem to "cheat" by using OS decoders. It starts instantly and the interface looks very nice (truly minimalistic and not just tiny and clumped up). I'm very much missing a time slider though. That's not a small feature to leave out of a media player. It only has fast forward and reverse, which is not very useful for things like skimming trough mixes. Internet radio playback is not supported. No easy way to integrate with Windows Explorer other than manually going through "open with" / "choose default program" for every relevant file type. I agree,minimizing to tray and hotkey would make this perfect. It works great from my mp3 player.It can use the random playlist the mp3 player generated so I dont miss the random button so much. Could be a good alternative to 1by1 in the future. Probably most people will like this player for its indexing feature. Though, it's missing a bunch of features that would make this a contender like hotkey support and the ability to minimize to tray. Would be nice if there was a random button as well.